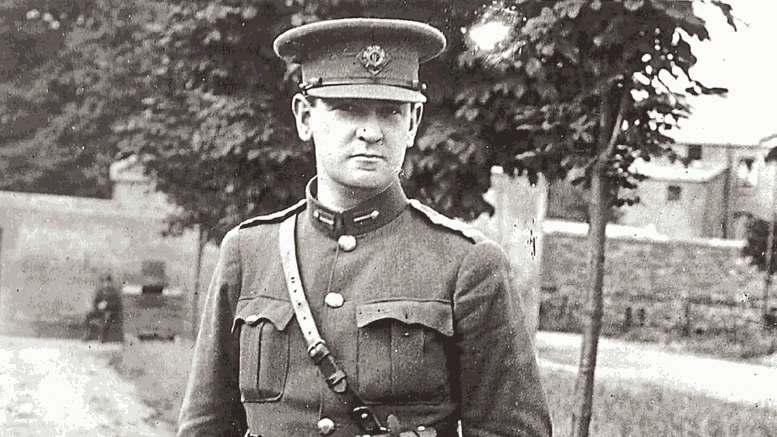 Michael Collins was the son of a small farmer from west Cork. Born on 18th October 1890 he was the youngest of eight children and educated at a local school. His father, Michael, passed away when the young Collins was 6 years old. Young Michael’s life was heavily affected by stories of the Fenians and the United Irishmen. Many of the people surrounding him, including his father, his teacher and the local blacksmith had been members of the Irish Republican Brotherhood. In 1906 Michael emigrated to London where he initially worked as a clerical officer with the Post Office Savings Bank. In London he immersed himself in Irish expatriate organisations such as the GAA and the Gaelic League and he also followed the footsteps of his father by enlisting in the IRB. After 10 years he returned to Ireland in January of 1916. Avoiding conscription into the British army and to participate in the coming rebellion. During the 1916 Easter Rising Collins was appointed aide-de-camp to Joseph Plunkett and was stationed in the GPO. Collin was captured in the aftermath of the rebellion and interned in Wales. He was released in December 1916 and returned immediately to Dublin. He spent the next few years helping to rebuild the republican movement and advancing its message to a more receptive populace. The general election of 1918 gave Sinn Féin a landslide victory and they immediately set up Dáil Éireann as an independent Irish Parliament. In January 1919 Collins was appointed as member of home affairs and in April minister of fiancé. His remit included not only the raising of monies to finance the Dáil, but also the gathering of intelligence and the organising of resistance to the British. As the war of resistance intensified, Collins, remaining in Dublin, took on the British intelligence unit based in Dublin Castle. This unit, known as the G-Men were infamous for their brutal treatment of prisoners and suspects. On Sunday morning, 21st November 1920, Collins sent out eight assassination teams and killed 11 members of the British Intelligence. In retaliation, that afternoon, the British machine-gunned Croke Parke during a football game between Dublin and Tipperary, killing 12 people. They also murdered prisoners Peter Clancy and Richard McKee, who were IRB leaders and a civilian, Conor Clune, who had been arrested the previous night for breaking the curfew. Collins, even though there was a price on his head helped to carry the coffins at the funeral. The war escalated even further and atrocity followed atrocity. Sectarian warfare broke out in Ulster. By July 1921 after a year of vicious attacks by both the IRA and the British military, both sides had reached a stalemate. On October 1921 negotiations started in London as part of a truce. Lloyd George represented the British, Arthur Griffith for the Irish, and an unwilling Michael Collins. After two months of intense debating the Irish delegation signed.Collins in doing so believed he had signed his death warrant. What the treaty gave was not a republic but a free state within the empire, the British were to hold 3 ports and the Dáil members to take the oath of allegiance to the British monarch. It also gave the 6 Protestant dominated counties of Ulster, Derry, Down Armagh Antrim Tyrone and Fermanagh, their own government, the very thing that Unionists had said they never wanted. This treaty was unacceptable to many Republicans and was passed in the Dáil by only a majority of 7 votes. It was to bring about a division which would plunge the country into another blood bath. Those who opposed the treaty were led by Eamon de Valera. Arthur Griffith became the president of Dáil Éireann and appointed Collins as Commander in Chief of the Free State Army. In June 1922 the anti-treaty forces occupied the Four Courts in Dublin and Collins bombarded them, using guns borrowed from the British. The country erupted into civil war. It was a war more savage than the one against the British. On 22 August 1922, Michael Collins was completing a tour of inspection close to his home town of Clonakilty. As he was passing though Béal na Bláth, anti-treaty forces ambushed his convoy. Collins ordered his men to return fire and was killed during the ensuing gun battle.